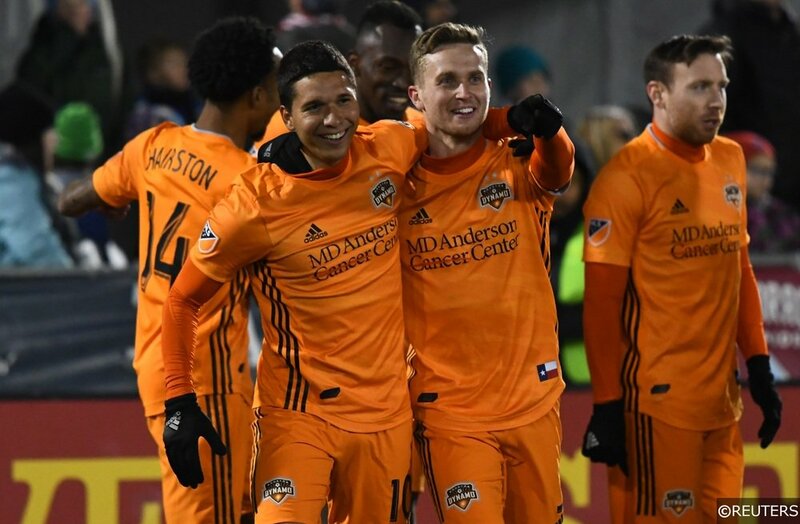 The 2019 MLS season has started in better spirits this year for the Dynamo. Can they keep this streak going? Can they keep playing like an elite team? The Dynamo are off to a great start this season. As a matter of fact, they are winners of four straight. Their victories have come against decent competition so far. And as a whole, the team is playing solid in all facets of the game. Their 4-1-0 record has them in the fourth spot out West. Not bad considering how up and down this team was last season. The additions that were brought in this season have certainly helped. But, it is indeed some old faces making all the noise and leading the way. The Dynamo’s offense has been particularly good this season. In fact, they have opened up the year scoring 12 goals. The two guys to thank for that are Mauro Manotas and Alberth Elis. Both guys have worked beautifully together. Let’s take a look at the last four victories. Saphir Taider made things look bleak for the Dynamo in the 34th minute. Unfortunately, Montreal wasn’t aware of the Dynamo’s young spark plug named Memo Rodriguez. He quickly tied things up with a nice shot in the 36th minute. Following a relatively quiet second half, Houston’s star striker Mauro Manotas finished the game off with a goal in the 86th minute. The Dynamo put constant pressure on the Impact defense. 14 total shots against their defense with six coming on target. This game saw the Dynamo offense take care of the first half, and the defense hang on in the second half. Granted, the Whitecaps were fighting to stave off a third straight loss in this game. However, that young phenom Rodriguez refused to slow down. His impact could be felt in two different parts of the game. The first goal came just 15 minutes into the game and boy was it nice. The shot was courtesy of a hard working Elis cross. Speaking of Elis, he would convert a penalty of his own and put the Dynamo up 2-1. The first half was a pretty productive half for the Houston offense. Vancouver found a way to tie the game up in the 54th minute, but it would be quiet for the next 20 or so minutes. Then in the 73rd minute, that Rodriguez guy struck once again. For the remaining third of the game, the Dynamo managed a beautiful defensive effort to hold on and win. This was without a doubt one of the better performances of the Dynamo this season. While the Rapids shot their chances with two own goals, Houston came in and took care of business. That guy Rodriguez opened up the scoring in the fourth minute and it was downhill from there for the Rapids. The first nail came in the 15th minute. Axel Sjoberg scored the first own goal of the game and the Dynamo attack had fun with him all game. Keegan Rosenberry’s own goal in the 34th minute made it 3-0 and the first half was all Houston. In the second half, things were quiet until the 67th minute. Elis scored the fourth Dynamo goal and that sealed Colorado’s fate. A late goal by Kei Kamara in the 81st and a Tommy Smith red card in the 89th minute were the only eventful things on the Rapids end. Overall, this game showed just how dominating the Dynamo can be. If they play relentless like this they are awfully tough to beat. This one was a fun one to watch. The first half was primarily dominated by the Dynamo. However, the referee didn’t quite agree with them. At least two goals were nullified by the referee in this game. A penalty was awarded to Houston in the 37th minute. Manotas was given the opportunity to take the penalty but missed it. However, the ball hit the crossbar and came back to Manotas, only for the goal to be called off due to offside. Other than that the first half was scoreless. Things got going in the second half. Elis finally got a shot in and scored the first real goal of the game. San Jose’s Jackson Yueill quickly equalized in the 56th minute. Four minutes later, Tomas Martinez sealed the game with his goal. A red card in the 87th minute for Marcos Lopez made life hard on the Earthquakes. Joe Willis made four key saves and Manotas put in two assists in a convincing Dynamo victory. The defense unit held up fairly well once again. While this season is still young, there is no doubt that the Dynamo means business this year. However, this team must play as stout on both ends as they have. If they can keep up like this, watch out MLS. The men in orange are here to play for something. Next up for the Dynamo, the L.A. Galaxy in Los Angeles. Power on, Orange Nation. For more on the Dynamo, stay tuned to NGSC Sports all season long. Until next time, folks.